In my quest to find a quality Makita portable air compressor that would fit all of my needs, I realized that I was going to have to spend a lot of time to find the perfect one. Some air compressors are too big, too noisy, not powerful enough, or a plethora of other issues that I didn’t like. But after several hours of research, I finally found the perfect air compressor for my shop, and I couldn’t wait to get online and tell you about it. When I came across the Makita MAC2400 Big Bore Air Compressor, I knew right away that I had to get it as quickly as possible. From the power to the noise level and even the ease of use, it checked off all the boxes that I needed in a quality air compressor. It’s powered by a 2.5-horsepower motor and is constructed with a cast iron cylinder, which is going to make it last in my shop a very long time. I’m no expert when it comes to picking out an air compressor, but I’m confident that I won’t have to buy another one for a while now that I have the Makita MAC2400. What Separates the Makita MAC2400 from Other Air Compressors? Who Should Buy the Makita MAC2400 Air Compressor? After reading all the positive reviews on this air compressor, my expectations were pretty high. I expected to hear a best quiet portable air compressor, and at 75dB, that’s exactly what I got. I also expected to receive a sturdy and durable compressor, and at around 80-pounds with a solid cast iron pump, I would say it meets those qualifications as well. The low AMP draw is also a feature that I really didn’t think would be important, but it actually is. I never have to worry about tripping a breaker, like some other air compressors do when they start up right away. And probably the best part about it was that I took it out of the box and was ready to use it in about 20 minutes because of the clear instructions and easy setup. Sometimes just the fact that this air compressor works without flaws is what makes it a great product. I’ve used it on multiple occasions and I have yet to find an air leak, and it consistently holds the psi that I need. The dual 4.2-gallon tanks can sustain an operating air pressure of 130psi, which is plenty of pressure to operate two nail guns. No matter if you have small jobs or larger jobs to complete, the Makita MAC2400 air compressor can get the job done for you. The first thing you will notice about the Makita MAC2400 air compressor is that there aren’t many pieces of plastic on it. It is constructed with durable materials that are built to last in even some of the harshest job sites. If you only need an air compressor for your shop, then it is going to last even longer because it won’t be out in the elements. The oil-lubricated pump allows the air compressor to run more efficiently, which saves energy, reduces noise and increases the lifespan of the unit in general. The compact design is also unmatched with other comparable products in the industry. Depending on the layout of your workshop, some people may not even realize it’s there when they walk in. Other air compressors are big and bulky, which make them difficult to move. With the Makita MAC2400, it’s easy enough to roll it where you need to, and light enough to load it up in the back of your truck if you need to transport it somewhere. There are many reasons why professionals and contractors are buying the Makita MAC2400 air compressor. And some of those reasons are the same as why average people like me would buy it. 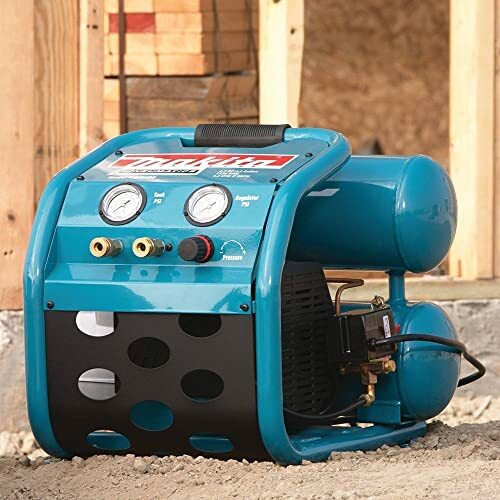 If you’re someone who wants to buy tools that will last a long time and still perform like they are brand new, then this is the perfect air compressor. No matter if you want to use it just to air up some tires or use nail guns with it, you won’t regret having it in your shop. When it comes to air compressors, most people have had the same one for many years. Those models are inefficient, loud and unsightly. Even if your compressor is working fine, you owe it to yourself to have some peace and quiet and get rid of your eye sore in your shop by upgrading to the Makita MAC2400. Despite the compact size and convenient features that this air compressor has, it does have one logistical issue that can be an annoyance. The air filter sticks out of the side and can get in the way of cords, or it could be bumped if you walk by it. You have to pay special attention when transporting it as well, because you don’t want to damage it. Other than that, I can see where it could get heavy if you have to move it frequently throughout the day. Moving it occasionally wouldn’t be too bad, but just remember that the unit is around 80-pounds, which can get heavier as the day goes and you get tired. 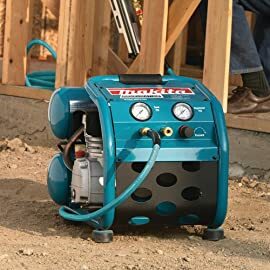 I read dozens of reviews on the Makita MAC2400 Big Bore Air Compressor, and I have to say that I agree with just about all of them. I have owned a few different types and styles of air compressors, and this one is by far the best I’ve had. Make no mistake about it, though; buying an air compressor is a pretty big investment. You can expect to spend well over $500 on most air compressors. However, the Makita MAC2400 Air Compressor is one of the best values on the market, and it is available on Amazon for Currently Not Available*. I’ve seen the reviews and I’ve used this air compressor myself. Take my word for it when I say you don’t have to look any further and don’t delay in purchasing this air compressor for your shop today. Get more information about an another product here: Senco PC1010 1-Gallon Compressor Review.